1st Singapore Roundtable 2018: Collaboration Will Be Key in Doing Good Better. To usher in the new year, APC convened a Singapore roundtable on 25 January 2018. Members gathered at the Asia Centre for Social Entrepreneurship and Philanthropy (ACSEP), at the NUS Business School, where host, Keith Chua is Chairman of the Advisory Board. 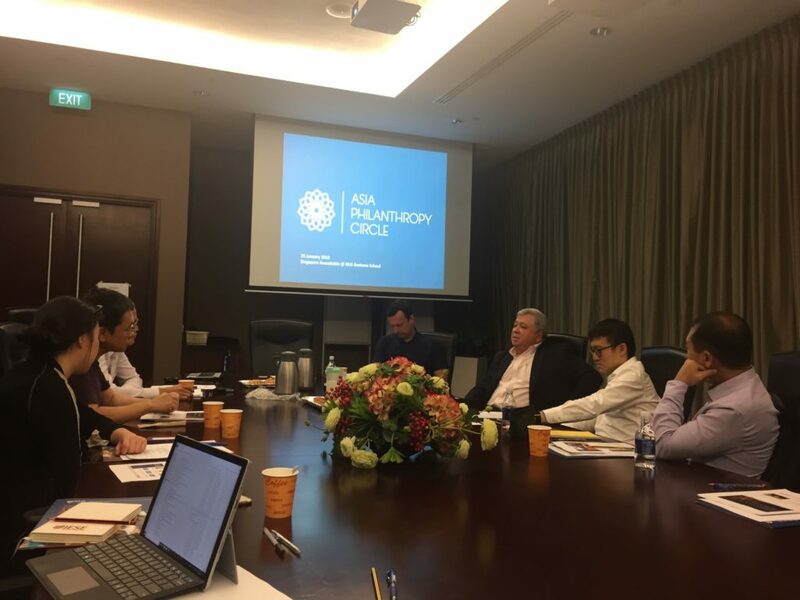 Members discussed the growing momentum of philanthropy in Asia, and their aspirations to contribute to the mission of greater good. Dean Bernard Yeung welcomed the members and explained ACSEP’s mission of advancing the impactful practice of social entrepreneurship and philanthropy in Asia through research and education. While philanthropy is not new in Asia, Dean observed that philanthropy is on the rise with growing wealth occurring amidst widening socio-economic inequality. There is an emerging generation of entrepreneurs and leaders who care about their communities and are interested to leverage their skills and resources to address social concerns in the region more effectively. ACSEP’s role is that of a catalyst to transform and empower individuals in supporting this mission of doing good better through research, education and outreach. Contemplating the dynamics of today’s rapidly changing world, members acknowledged that collaboration will be key to maximize the impact of philanthropy. To this end, Laurence introduced the ASEAN Community Impact Funds (ACIF), which is an umbrella of funds that intended to facilitate different members’ appetite for collaboration and control. Thus far, two sub-funds have been launched and APC hopes more will emerge over time. The Myanmar Community Development Fund focuses on capacity building and community development in the Taunggyi District of South Shan State, while the 1000 Days Fund is focused on early childhood development and nutrition in Indonesia. While each sub-fund has to be championed by a member, the donors need not be confined to APC membership. Both were started by Singapore members. Members also mused on the false dichotomy of doing well and doing good in life. Rather than having to choose between the two, it is possible to do both at the same time. In fact, members are walking the talk themselves, and hope to encourage and inspire more to do the same. Mark Chang shared about his work with the Massachusetts Institute of Technology (MIT), his alma mater, to include financial literacy as a core module in its undergraduate curriculum. He observed that graduates often go on to well-paying jobs but fail to achieve financial freedom by retirement age due to poor financial planning. He hopes that financial literacy would help graduates achieve financial fitness for themselves and enable them to give more back to society. In the year ahead, APC is looking forward to generate new regional activities started with Singapore members as champions. This includes the ASEAN Peace Fund to promote religious and racial harmony in the region and a member interest group on social entrepreneurship to support sharing and learning amongst members. APC will also look into requests from roundtable participants to gather and share best practices on engaging key stakeholders like universities and government.